Ok, so this is not the most enjoyable topic and we understand your anxiety about having this type of work done. However, the future health of your teeth and even overall health in some cases depends on fixing some of these serious problems. Each tooth presents its own challenges, but with Dr. Burton's expertise, each individual tooth to your entire smile looks whole and healthy again. From minimally invasive fillings to porcelain crowns, Dr. Burton's experience of over 35 years is what many patients look for to ensure optimal comfort and long lasting results. If you've ever had anxiety about coming to the dentist or felt discomfort during any dental treatment, Dr. Burton is certified to provide you with medication to help relax you, providing a much easier time for any procedure or treatment that you have been avoiding. Special equipment like the Diode Laser replaces the need for traditional cutting and stitches that can often be painful during restorative procedures. Dr. Burton's priority is to make sure you are comfortable and that his course of treatment is designed to minimize pain and promote a quick recovery! An essential part of holistic dental care is taking a conservative approach to restoring your smile. Dr. Burton uses the most advanced composite materials for broken and decayed teeth. White fillings are durable, rebuilding your smile while also enhancing its appearance. We use only the highest grade of biocompatible materials for all restorations, including fillings. Dr. Burton uses high quality porcelain and ceramic for our full coverage dental crowns. The bonding materials around each crown prevent new cavities and extend the longevity of the restoration. Your new aesthetic crown will feel, look and wear just like a real tooth. Did you know that the loss of a permanent (adult) tooth can cause both bone and gum tissue to recede? 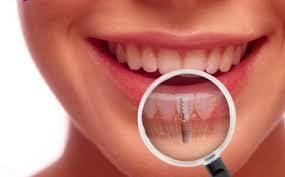 Did you know that your teeth will also shift into new positions if even a single tooth is removed? This may not sound serious, but if your “bite” is realigned, it can cause everything from headaches and jaw problems like TMJ, to teeth grinding and the resultant decay or breakage. Additionally, the health and well being of your teeth and gums can be greatly compromised by the absence of a single tooth, but when it is multiple teeth, the condition becomes very serious. Not only can your jawbone begin to shrink and your gum tissue diminish, but your facial muscles will collapse, as well, making you look unnaturally old. As the ideal solution for a full dental restoration, dental implants are also good for those who have cosmetic dental problems. After all, some dentures and partials can rely on dental implants for stability, and this provides the benefit of preserving gum and jaw tissue while also giving you a functional and healthy smile. Dr. Burton recommends either the Nobel Biocare’s system or 3i System as options to meet any dental problems with premium outcomes. There is no better compliment than a referral. Call us about our referral program!